The hacktivist network Anonymous sent shockwaves around the internet this morning with its latest announcement, which in theory, could have wide-ranging implications, but honestly, it’s pretty tough to tell: At 8 a.m. EST, Anonymous released the names of all the people who worked at Kohl’s in 2003. Well, this is officially bad for the department store chain, probably. Anonymous usually has some sort of point with these things, right? 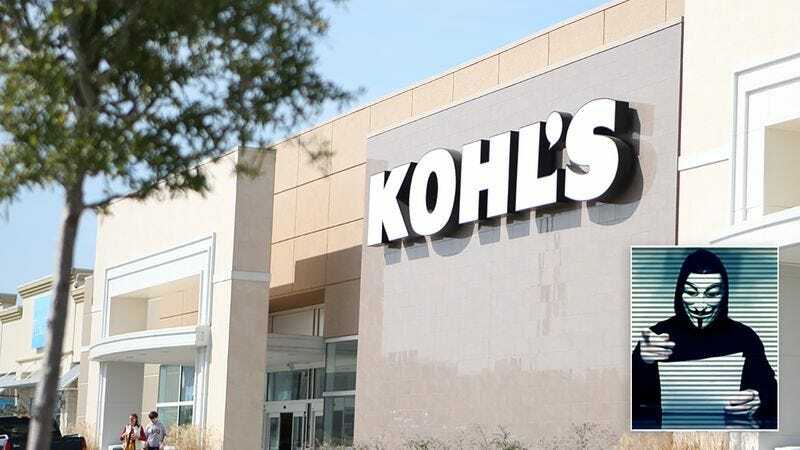 Kohl’s has yet to release a statement, so for now we can only guess as to what prompted this disaster scenario, provided that’s a fair description of what’s going on. Maybe Kohl’s did something bad and Anonymous is punishing them? The list of names does feel a little long, so maybe too many people worked at Kohl’s? Or is this a way to show the public that Kohl’s was committing fraud or something? Also, the name Brad Pitt was on there, but it’s probably not the famous Brad Pitt. It seems like it might be wise for all current or former Kohl’s employees to take some sort of precautionary action immediately. Like, if you told someone you didn’t work at Kohl’s in 2003, but you really did, or vice versa, you might want to start covering your tracks. But it seems like that’s kind of it as far as fallout from this goes, right? Maybe we’re missing something. Either way, the PR team over at Kohl’s should get ready to dig in, because this definitely has all the makings of a major scandal. Or not.